RC glider flying continues to be a most enjoyable branch of model aviation. At COGG we enjoy huge open grassy flying sites located on sod farms northwest of Toronto. 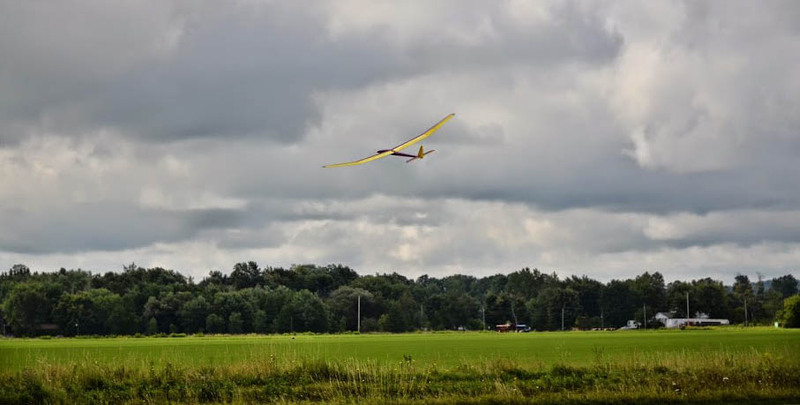 The scope of model glider flying has expanded immensely over the past decade with all the recent developments in fabrication techniques, electric motors and batteries, and electronic equipment. Our club specializes in Climb and Glide where most of each flight is in pure glide. Most forms of this mode of flight are welcome at our fields including towed gliders, hand launch, electric-power, rubber-powered Free Flight, and electric SAM to name a few. Liquid fuelled engines are not permitted. Generally cloudy. Slight chance of a rain shower. High 17C. Winds N at 10 to 15 km/h. Sunny. High 23C. Winds NNW at 15 to 25 km/h. Sunny skies. High 28C. Winds W at 10 to 15 km/h.